I’ve talked about GTA 5’s latest vehicle, the Progen Itali GTB Custom and my experiences with it in great detail. It is one of the best vehicles I own in the game and I will use it for some time to come. The Progen however, is not the only super car I have or of fast cars in general. I’ve got another super car as well. What is this vehicle? Say hello to GTA 5’s Zentorno and what a vehicle it is! We’ll take a closer look at it and I’ll talk about a recent experience I had with this amazing car. This is one of the fastest vehicles in the game and there are only 4 other super cars that have a higher speed rating than the Zentorno. If you go to the in game website, legendarymotorsport.net, you’ll see the cost of this vehicle as well as the listed specs. This vehicle can push out 750 horse power and sports a 6.8 L V12 engine. The Zentorno can also go from 0-60mph in 2.8 seconds, sometimes slightly lower as well. It makes for quick getaways with its super fast acceleration. This hyper-car costs $725,000 at Legendary Motorsports and then if you decide to upgrade or modify it, be prepared to shell out even more cash. At the time I purchased that car, I had around $4 million dollars so I was able to purchase the car as well as upgrade it. If I were to compare this one to the Progen Itali, I’d say it edges it especially when it comes to acceleration, but not by much. Both of them are very fast, but one of these fared a little bit better when it came to police chases. Time to talk about my latest experience with it. Don’t worry, I’m not taking it to Mount Chiliad…..for now. When I start my online game, my created character is in the shower, but I quickly get out of there and head down to the garage. Along with other my other vehicles in there as well as the Progen, lies my beautiful black, sleek, and fast Zentorno. I quickly get in it, exit the garage, and plot my course to the Los Santos International Airport. It’s nighttime currently and there are a number of other players in my session, but fortunately not a lot of them are near me so I don’t have to worry much of death and destruction that a lot of online players engage in. 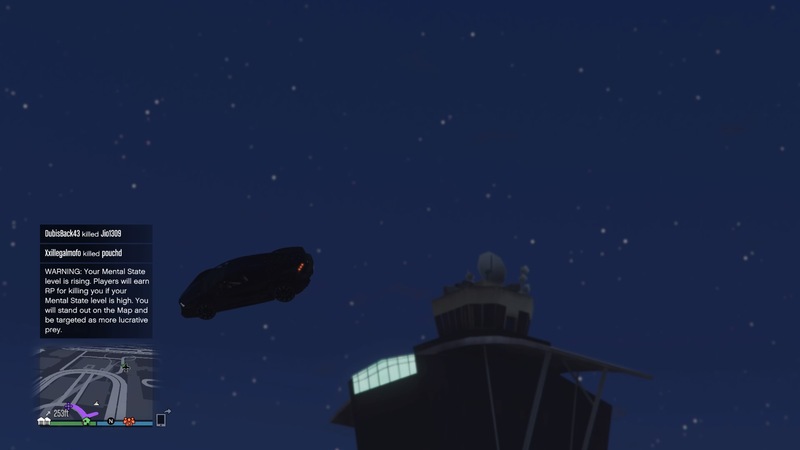 Once I arrive to the airport, I immediately try some of the stunt jumps that I did when I first tried out the Progen Itali GTB Custom. Let me tell you, with how fast the Zentorno is able to pick up speed, I hit some of those ramps hard and went WAY up in the air doing flip over flip. I didn’t necessarily land successfully, but it was quite fun doing those jumps to see how high I could get. After trying one of those stunt jumps however, I landed in area that I just could not get my car out of. I landed in a small area that had a railing on one said as part of one of roads in the airport, and then surrounded by a small wall of shrubbery on all the other sides. No matter how much I tried, my car would not go through it and there was no way to get over them. After trying repeatedly, my car gets stuck between a tree and the railing and I just cannot get it out of there so there’s only one thing left to do now. I unfortunately must get out and destroy my car. I threw a sticky bomb on it, ran back a little ways and hit the trigger button causing the destruction of my Zentorno. I’ve got insurance to get it replaced, but in the mean time I have to get out of the airport because that explosion has alerted the police. I manage to steal a car and plot my route to where I need to go to get my replacement Zentorno. As I race to get out of the airport (with a much slower car), I get a two star wanted level because 2 cops I drive past end up shooting at me. It doesn’t matter though as I make it out of the airport and manage to lose the 2 star wanted level. As I’m on my way to my destination, I pull out the in-game smartphone and call the insurance company to replace my super car which costs over $9,000. Remember, I have over two million dollars so the cost doesn’t really hurt. The car is waiting at the depot for me and when I arrive there, I’m ready to get in and speed away! Escape from the Police part 2! 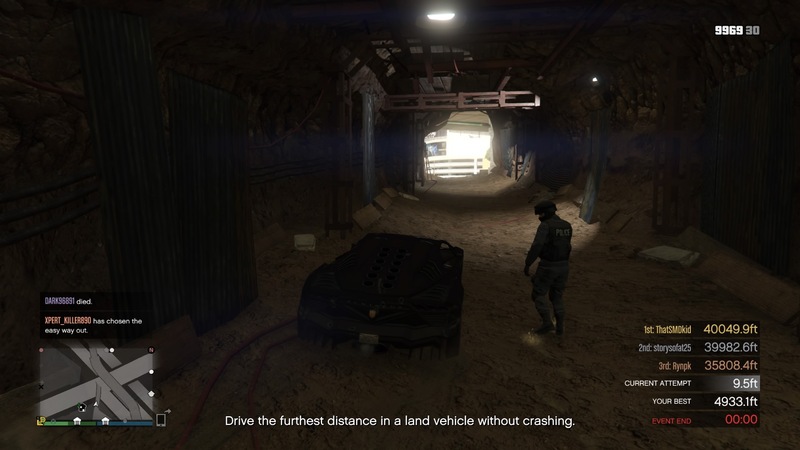 If you read part 3 of my experience with GTA 5’s newest vehicle, then you’ll remember what I did at the military base which got me an instant 4 star wanted level which is VERY difficult to survive the police at that level. I was doing a fairly decent job, trying my best to get back into the city to my special getaway/hideout that goes under the city thanks to an entrance from the freeway in downtown Los Santos. The Progen certainly is a fast super car and I was doing my best to dodge multiple roadblocks as well as continuous gun fire from the helicopters above. Unfortunately, I just couldn’t quite make it there as I was eventually killed from the gunfire from above. Now that I’m driving my other super car, the Zentorno, it’s time to try to recreate what I did with the Progen and see if I can actually make it this time. Once I get into the hyper car, I get on the freeway and head straight to the military base. It is a good distance away, but with the speed of my car, weaving in and out of traffic, I make it there in good time. Last time I went through the arm guard and smashed the military security guard into the main fence with my Progen. This time I just get out of my car and shoot my military assault rifle at him, but not before he gets one or two shots off on me, quickly depleting my armor. Just like before, I get an instant 4 star wanted level. I quickly hop back into my car and off I go to head back into the city! The crazy thing is, the cops don’t start to chase me until I emerge from the tunnel on the main highway and things just escalate from there. Cop car after cop car appears, especially in front of me, but I’m generally able to dodge them. My poor Zentorno is taking heavy fire, but she keeps on speeding along. My character inside the car is getting hit by bullets as well causing my health to rapidly deplete at times. Unlike the Progen though, I don’t have any punctured or busted tires and I’m able to drive as fast as possible while trying to maintain as much control as I can in a furious police chase such as this. There are a few times that I do end up crashing into some of the police vehicles as well as a couple of regular cars from the traffic, but I’ve been able to recover quickly and speed off. Believe it or not I make it back into the city and onto the freeway and I make it to my hideout! I wait it out for a bit so that the 4 star wanted level disappears. As I head back out the way I came in, there’s a cop left over from the chase just casually walking out of the entrance as well. As I start to drive past him slowly, he takes a look at my car suspiciously. I eventually get out and attack him and of course I get another wanted level, but this time it’s 2 stars. Instead of taking my car back out though onto the freeway, I head back underground, but this time deep underground, driving in the tunnels under the city. I eventually find a way out and back onto city streets and I take my bullet ridden Zentorno to a Customs shop to get repaired. After that is done with, it’s time to take my car back to my garage. I’m pretty impressed with how this vehicle did. I survived the onslaught of police after my incident at the military base and I didn’t have to pick up my car at the impound at police headquarters. I hated that I had to destroy the vehicle though at the airport, but the replacement model did very well. What made this experience easier though is that I didn’t have to deal with other online players who love to ruin your fun by trying to kill you at any given moment or trying to destroy your vehicle. So now you’ve read my experience with GTA 5’s Zentorno. What are your thoughts on my experience with the Zentorno vs the Progen? Check out the video of my entire experience below. One of my favorite games of all time, and one of my favorite cars in GTA of all time, sadly, I could never afford it online because Rockstar thought I was cheating (when I really wasn’t, I had mods for SINGLE player not online) and suspended me and took away all my money, so I am back left with only $10K sadly lol and you know you cant do much with that. Oh gosh Bassam, that really stinks! Too bad you can’t appeal it, but I know Rockstar is extremely strict about mods even if it is just for single player. Try doing some of the online Heists, those can really help you net a lot of cash in a short amount of time.